Have Valsartan Lawsuits Been Filed? Valsartan lawsuits are currently being filed against companies that distributed or sold valsartan blood pressure medication found to contain NDMA, a human carcinogen. Individuals taking the contaminated medication may be at an increased risk for certain cancers and kidney/liver injuries. Valsartan (Diovan) is an oral medication used to treat high blood pressure (hypertension), recent heart attacks, and congestive heart failure. It belongs in a class of drugs called angiotensin receptor blockers (ARBs). There are a number of substitute medications available to individuals who have been prescribed the contaminated medication. Consumers are being advised to carefully analyze the medication and speak to their medical professional about options. Individuals taking Valsartan should not stop taking the drug suddenly. Speak to your doctor or pharmacist to determine if your current medicine was part of the recall and if so, you will likely be provided with a replacement or different treatment option. The FDA is alerting healthcare professionals and patients that several lots of a common high blood pressure and heart failure drug containing Valsartan have been recalled in the U.S. because they contain an impurity that poses a potential cancer risk. Not all products manufactured by these foreign companies and distributed in the U.S. are being recalled. Patients using high blood pressure medicines should look at the drug name and company on the label of their prescription and compare it to the FDA list or call their doctor/pharmacy to check whether their medicine has been recalled. 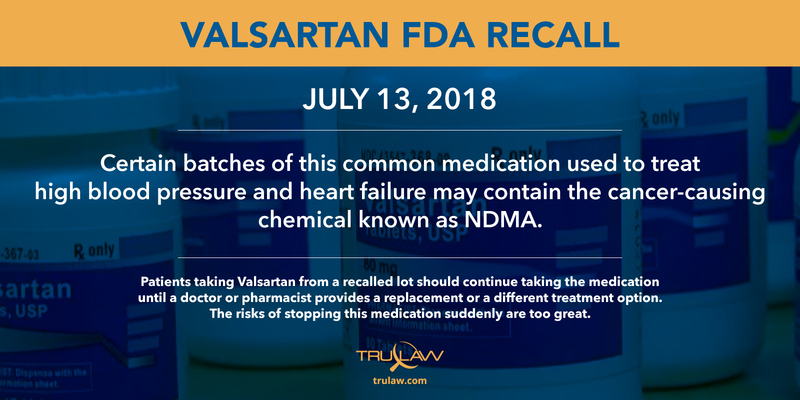 The Valsartan recall resulted because of the presence of the potentially cancer-causing impurity, N-nitrosodimethylamine (NDMA). The FDA believes that the impurity may have been in the Valsartan-containing products for as long as four years. NDMA is a known environmental contaminant that forms in both industrial and natural processes. It has been used to make liquid rocket fuel, softeners, and lubricants and can be found naturally in meats, dairy products, and vegetables. Exposure to high levels of NDMA may cause liver damage in humans, according to the U.S. Environmental Protection Agency. Test results from the affected valsartan-containing medications found the amount of NDMA exceeds acceptable levels. The FDA is working with drug manufacturers to determine the full impact of the unsafe impurities and to ensure future valsartan active pharmaceutical ingredients are not at risk of NDMA formation. We will continue to update this page as we learn of changes due to the ongoing investigation. NDMA has been founded to increase the occurrence of cancer in animal studies and have been labeled as a “probably human carcinogen” in humans by the U.S. Environmental Protection Agency. A lot is currently unknown about the increased risk of cancer or other serious injuries that may result from this impurity. Investigations are ongoing. TruLaw will consider investigating this risk. We believe that even a small increase in the risk of injury/diagnosis is one that should be warned about so patients can make an informed decision about the medications they take. TruLaw is aware that there are a number of individuals concerned that their cancer diagnosis or other injuries may be linked to the impurities found in valsartan, and we will continue to investigate these cancers/injuries and update the public as we learn more. TruLaw is currently speaking to individuals prescribed the contaminated medication and diagnosed with certain cancers or kidney/liver injuries. Lawsuits have been filed and we believe there will be many more individuals who may need to seek compensation for their injuries. You can fill out the Valsartan Instant Case Evaluation to see if you have a case to file. Valsartan lawsuits allege that Zhejiang Huahai, Hetero Labs, and other defendants supplied, manufactured, distributed and ultimately sold valsartan that was adulterated and defective because it contained the toxic substance NDMA. Class action lawsuits are seeking the cost of the medication plus medical expenses. Compensation from a valsartan lawsuit can help injured individuals recover from injuries that may have resulted from their use of the contaminated drug. Valsartan attorneys are now saying that individual lawsuits filed will be consolidated into a multidistrict litigation (MDL) at the beginning of 2019. 7/18/2018 – FDA clarifies which valsartan-containing products are being recalled. Includes medications manufactured by Zhejiang Huahai Pharmaceuticals, Linhai, China. Teva Pharmaceuticals USA labeled as Major Pharmaceuticals – retail level recall. 7/27/2018 – FDA explains NDMA and notes that the investigation into the safety of valsartan-containing products continues. Additional repackages of the products made by Teva Pharmaceuticals and Prinston Pharmaceuticals (labeled as A-S Medication Solutions, AvKARE and Remedy Repack) are added to the list of medications containing impurities. 8/22/18 – FDA releases a gas chromatography-mass spectrometers method for manufacturer and regulators to detect and quantify NDMA in valsartan API and finished drugs. 11/8/18 – Sandoz Inc. issues a voluntary nationwide recall for a lot of their high blood pressure medication Losartan Potassium and Hydrochlorothiazide due to contamination of trace amounts of N-Nitrosodiethylamine (NDEA) — a known human carcinogen. This is the same contamination that was found in certain batches of Valsartan. 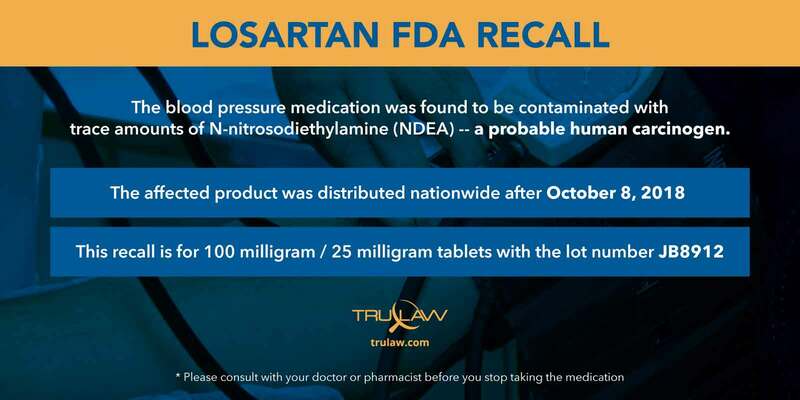 1/3/19 – Losartan recall has expanded again to specifically include 30-, 90- and 1000- tablets of 50- milligram tablets, and 90-count bottles of 25-milligram tablets. Tests again found trace amounts of NDEA above the interim acceptable intake level. The Losartan recall is specifically for 100 milligram/25 milligram tablets that have the lot number JB8912. The affected product was distributed nationwide on or after October 8, 2018. Should You File a Valsartan Lawsuit To Protect Your Legal Rights? Did you or your loved one take blood pressure medication? Did you then develop cancer or serious liver/kidney injuries? If you answered yes to these two questions you should look into your legal rights.Fill out our secure form below to find out if you are eligible for mesh litigation and potential compensation for your injury. Contact Us For Your Valsartan Case Analysis Now!